This week's theme over at I Heart Faces is "From a Distance," which focuses on photos that were taken at more of a distance. For this week, a face does not have to be clearly showing in the entry, but a person must be visible in the photo somewhere. Since we just got back from a week at the beach, I thought this photo would be perfect for the theme. 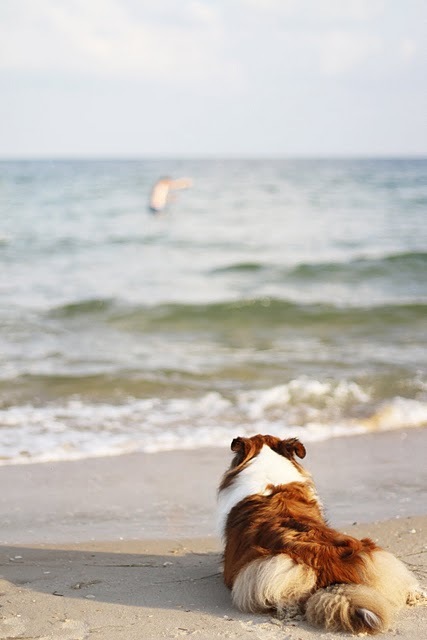 This is Mally on the beach watching Ryan cast his fly rod out in the ocean. We both love watching him cast, he's so graceful and rhythmic. 10 and 2, 10 and 2. Ryan fly-fishing really is a beautiful thing to watch. Make sure you go check out all the other amazing entries at I Heart Faces. Beautiful picture, your dog does look pretty content. Thanks for your comment! And my gosh - your dog is BEAUTIFUL! Great picture! of course I love this, bc I love the beach. :) Will have to go find you on Pinterest too. Love Pinterest! Looks like a nice day on the beach. This is such an amazing photo. I still cannot get over how beautiful your dog is! OH and I am SO EXCITED for your guest post! Your picked the perfect topic!!! Gorgeous image--and it sounds like I could learn from your husband's fly fishing skills! You're furry children are so photogenic! Nice picture, I like how your dog is focused on the person fishing. Is your dog an australian sheperd? thanks for your comment! it gaves me the opportunity to discover your blog.